Prepare a meal in a snap with this super fresh stir-fry. Stir-frying is one of the fastest ways to prepare dinner. Small cuts of food or bite sized foods cook up in no time when tossed into a hot pan. We even went a step further with this stir-fry, we topped it with lemon zest and shavings of fresh ginger root. Ginger is great for digestion, reduces pain and inflammation, and wards off some cancers. If you are increasing your omega-3 in your diet, shrimp is a great choice with .29 grams per a 3 ounce serving. 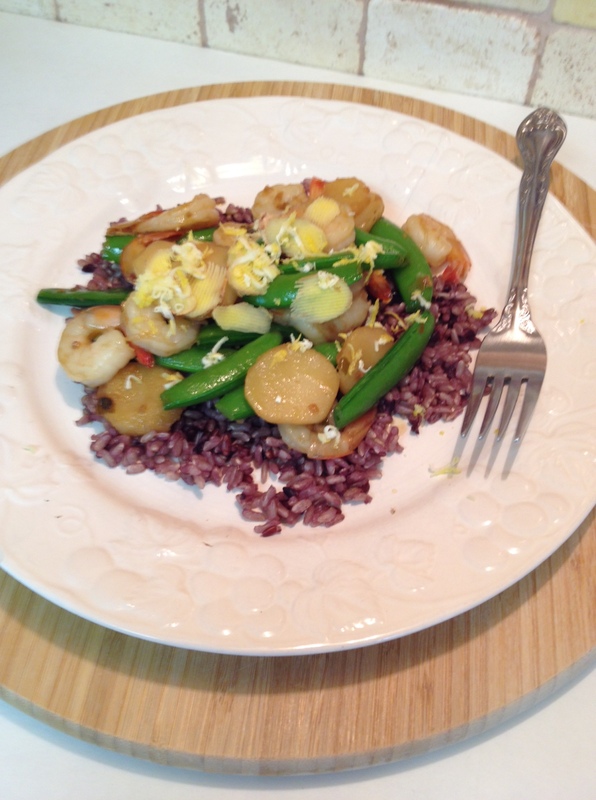 Our featured recipe is – Shrimp and Snap Pea Stir-Fry – and here is what you will need. Pour 1 cup of water and 1 cup of organic chicken broth into a medium sauce pan, add rice and bring to a boil on high heat. Once boiling lower heat to low to simmer for 45 minutes. What we do so the rise will not be soggy after cooking it, is place a dry clean towel over mouth of pot and place the lid over the towel. As the water evaporates and rises to the lid water forms again only to fall back over the cooking rice. With the towel in place, it will hold the vapor not allowing it to fall back over the rice. The rice is always 100% guaranteed to be fluffy. When rice is done remove towel, fluff with a fork and set aside. 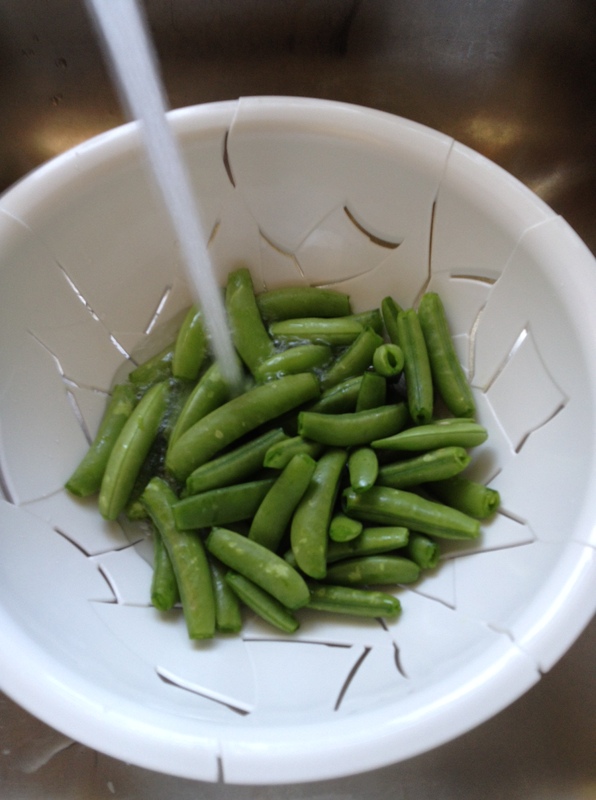 Meantime, wash and trim the Snap Peas and set aside. Next, open the can of water chestnuts, drain off liquid and set aside. Next place a large frying pan or a wok if you have one over high heat, add 2 tablespoons of olive oil. When heated add 1/8 cup of the stir fry sauce. Place peas and chestnuts into pan and stir-fry until snap peas turn a bright green in color. Place into a medium bowel and set aside. Using the same pan, add the shrimp and remaining 1/8 cup of stir-fry sauce. Stir-fry until shrimp is more oblique in color than orange. Add back the vegetables to shrimp and stir-fry 1 minute more. Remove from heat. Spoon some rice on to a dinner plate, spoon some shrimp stir-fry over rice and serve. 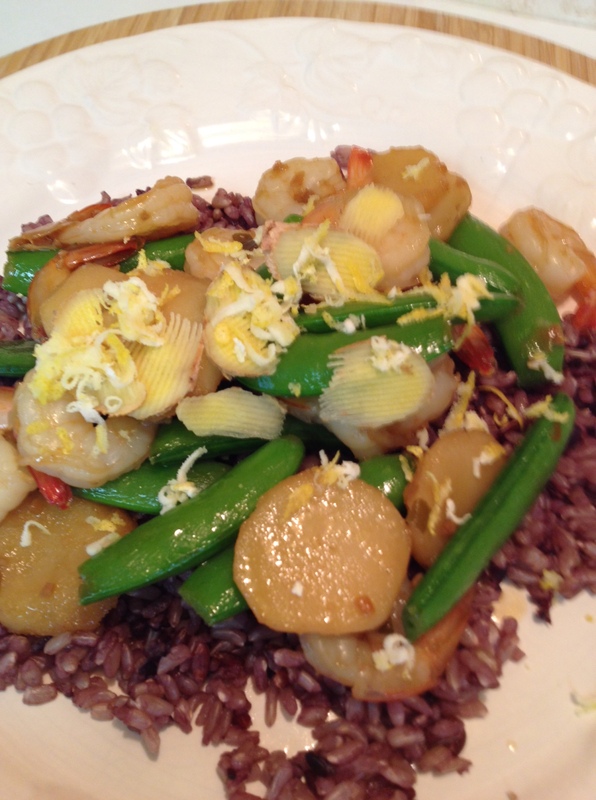 As we stated before hand, we topped the stir-fry with lemon zest and shavings of fresh ginger root. Enjoy the wonderful flavors of this splendid stir-fry. This entry was posted in Main Dish, Shrimp and tagged Broth, Cook, Ginger, Olive oil, Shrimp, Snap pea, stir fry, water chestnuts, Zest (ingredient). Bookmark the permalink. I love stir fry because it is quick and easy to make.. I know it is healthier as well. This looks delicious. Thanks, it was delicious. Stir-Fry’s always cook up fast leaving the veggies so crunchy. Thanks Honey for stopping by and leaving your thoughts on the recipe.